Some days it’s just hard to make dinner at home, whether you’re not feeling well or the day is jam-packed with activities. This is where easy meal prep can really come in handy. Learn below how you can easily plan & prep 3 dinners in 1 day. 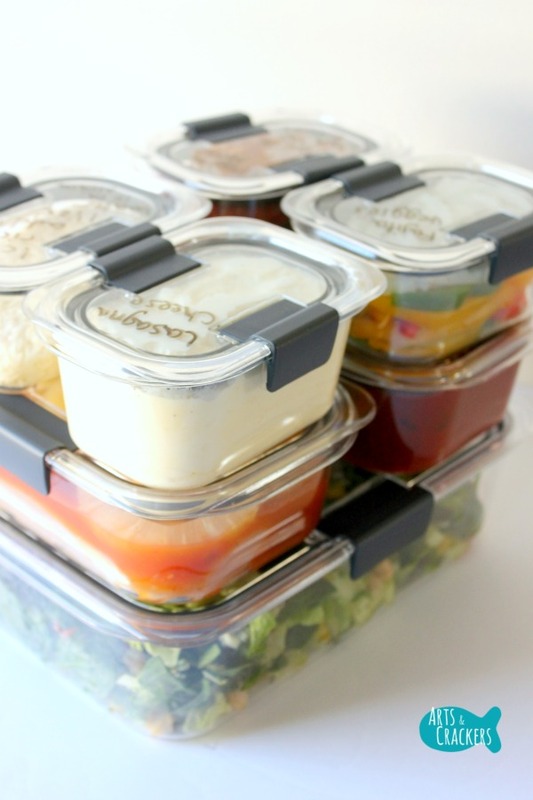 Rubbermaid food storage containers are a staple in our home, so I am happy to partner with Rubbermaid to share about the new Rubbermaid Brilliance line with this meal prep plan. When I meal prep, I will occasionally cook everything ahead of time and save it, but I really only do this when I am making soup to freeze. I’ve see all these meal prep plans where everything is already cooked, but not everything makes good leftovers. Others plan for the same meal for every single day of the week. I just couldn’t do that. Then you have the ones that are prepared for a whole week, but the leftovers don’t last that long. The way I meal prep is different. Instead, I want to share a meal prep plan that gives you options and ease while still overlapping ingredients to prevent waste. These meals are quick to prepare and Rubbermaid Brilliance containers are perfect for storing the ingredients in the refrigerator and keeping them fresh until use. Just prep ahead and when it’s time for dinner, just dump out the ingredients and cook! For this meal prep plan, I created three family favorites: Beef Fajitas, Hawaiian Chicken, and Meatless Lasagna (you can add meat if you wish.). Note: the reason I stuck with three meals is that meats, raw or cooked, only last for so long. This way everything stays fresh, and some meals will have enough leftovers that you will really have 4-5 days worth of meals. Look for my meal planning tips at the end! The 14-piece Rubbermaid Brilliance set comes with: 4 Small 1.3 cups containers with lids, 2 Medium 3.2 cups containers with lids, and 1 Large 9.6 cups container with a lid. They also offer smaller sets as well as sets with more sizes. 1. Slice bell peppers. Add some, not all, into the Rubbermaid Brilliance Small container. Set aside. 2. Mince about 1/2 cup worth of red and green bell peppers. Set aside. 3. Add pasta sauce, pizza sauce, minced peppers, and seasonings to the Medium size container and stir. Be careful not to over-fill or it will spill when the top is placed on. Rubbermaid Brilliance containers are perfect for liquid ingredients such as sauce, because they have an airtight, 100% leak-proof seal and latches and do not spill, guaranteed! See, I tested it! The containers are also stain-resistant. One of my biggest pet peeves in the kitchen is when food storage containers turn orange from red sauces, so I tested this out by making lasagna and leaving this one in the fridge the longest. Guys, my containers are all still crystal clear! 4. In a small bowl, combine ricotta cheese, mozzarella cheese, an egg, and black pepper until smooth. Scoop into one of the Small containers, taking care not to over-fill. Set aside. 5. Chop up the remaining bell peppers along with leafy greens and your favorite salad toppings (we added chickpeas and cucumber.). Dump this mixture into the Rubbermaid Brilliance Large container and set aside. 6. Now that your cutting board is cleared off, thinly slice an onion and add as much as you wish in the Small container with the thinly-sliced bell peppers, packing it all down just a bit to fit a good amount in there, then squeeze the lime juice over the top. 7. Pre-measure 1 cup of dry jasmine rice into one of the Small containers. 8. Thinly slice a flank steak and mix it with fajita seasoning and olive oil until evenly-coated. Pack into another Small container. 9. In the second Medium container, place two chicken breasts then pour in Hawaiian marinade and top with pineapple rings. 10. Place the lids on the containers and label them using a dry erase marker. Seriously, this is the best tip ever. When I’d bring my husband dinner at work, I’d send it with corny jokes, love notes, and doodles. I wanted to write on the actual containers, so I tested out a dry erase marker. It stayed on nicely then washed off with ease. Way better than using stickers that could leave residue. I just included what was in the container (i.e. “Lasagna Sauce” and “Lasagna Cheese”) then on one, if it was not a recipe I was very familiar with making, I would include cooking instructions such as bake time and temperature, how much water to add to the rice for cooking, etc. You may also want to add the dates they were prepared, though you should be making one a day so this may not be necessary. 11. Stack the containers in the refrigerator until you are ready to use them. The containers stack very nicely and neatly with the Large on bottom, two Medium containers on top of that, and the four Small containers on the very top. You can also use these to organize dry ingredients in your pantry. Rubbermaid Brilliance containers are designed to prevent splatter in the microwave, as well. Just open the latches and keep the lid on when you microwave them. Since I had leftovers from the Beef Fajitas, I tested this when I heated it up for lunch the next day. No splatters! Okay, so maybe this is my biggest kitchen pet peeve…I cannot stand a dirty microwave. This feature is probably my favorite! You can meal plan this way for many different basic meals. Keep in mind that some ingredients (such as the lasagna noodles) are just fine being kept in their original packaging until needed. Other recipes may need to be cooked immediately after they are prepared, so you can use these Rubbermaid Brilliance containers to store leftovers or side dishes. Some dishes (such as ones that use ground beef or shredded chicken) should have the meats pre-cooked. Another key ingredient to easy at-home dinners is meal planning. Follow along with some of my meal plans and tips and download the meal planning and shopping list printable (instructions within my meal plan posts.). Have any meal prep tips and hacks? Share with me in the comments! family, food, food storage, hacks, homemaking, meal planning, meal prep, recipe, Rubbermaid. Bookmark. Love this post! The recipes, meal prep and everything looks so effortless! This would make meals so much easier at our house – those containers from Rubbermaid are awesome and I love that you thought to use dry erase markers to add the contents and instructions!! It definitely is inspiring me to think ahead on meals so we avoid the dreaded question (What’s for dinner?)!! Thank you! Yes, I really struggle with “What’s for dinner?”. Meal planning and prep is so helpful for that. This is really helpful. I have never been able to meal plan successfully. You make it look so easy – probably because you have the right tools…. off to the store I go! Thank you, Tove! It really was easy and the Rubbermaid Brilliance containers are seriously awesome for meal prep. Your recipes and photography are So amazing! Thank you for sharing this info.